Thom Browne, the 52-year-old American designer, is sitting in his office in midtown Manhattan. He is wearing a cropped tailored jacket, an unironed Oxford shirt, a slate grey tie held by a silver tie bar, tiny cable knit cardigan and a pair of tight, high-waisted tailored shorts with a fit best described as snug. The look — slim, shrunken, smart — is a jolt. “Isn’t it amazing? It’s been 15 years and I still feel it looks new,” he says of the silhouette he first introduced to menswear in 2001. Browne’s decision to dramatically change the proportions of the suit marked one of the most influential shifts in menswear in recent years. Has your jacket and trouser length shortened of late? Is your tailoring tighter? Do you bare your ankles, or spend the day cursing men who do? You have Browne to thank for this. 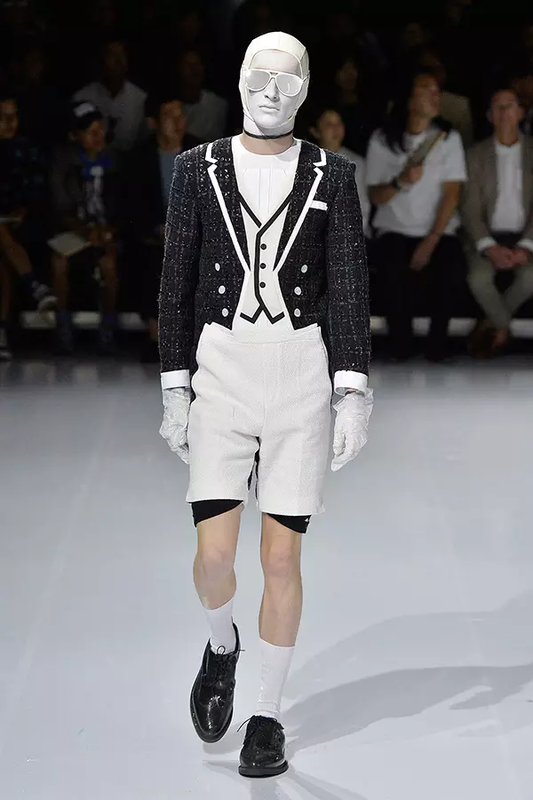 For many metropolitan gentlemen of standing, the Thom Browne look has become a uniform. “I can’t think of anyone who has revolutionised the way men dress in the past 15 years more than he has,” says John Demsey, executive group president of The Estée Lauder Companies, who has been wearing made-to-measure suits by Browne since the beginning. Browne’s name is relatively unknown. Yet quietly and determinedly he has built an extraordinary brand. His menswear is stocked in almost 250 stores worldwide, his womenswear stockists near 120. An industry source suggests “Thom Browne is a $100m business”, with sales split fairly evenly between US, European and Asian markets. 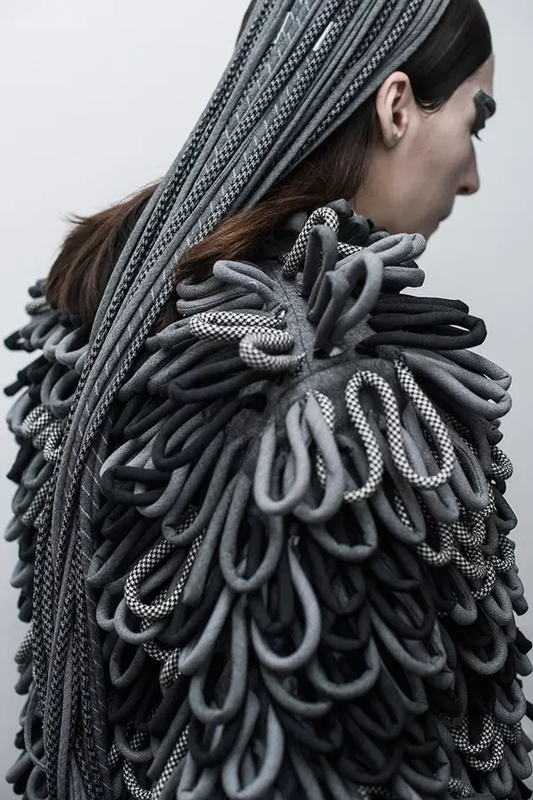 By following his instincts, and sticking to his own aesthetic, he has become one of the industry’s most successful players, a success that will be acknowledged in New York in September when he will be awarded the Fashion Institute of Technology’s Couture Council award for Artistry in Fashion. Browne’s idiosyncratic and fabulously perverse thinking informs his whole business. The guy is a hoot to be around. 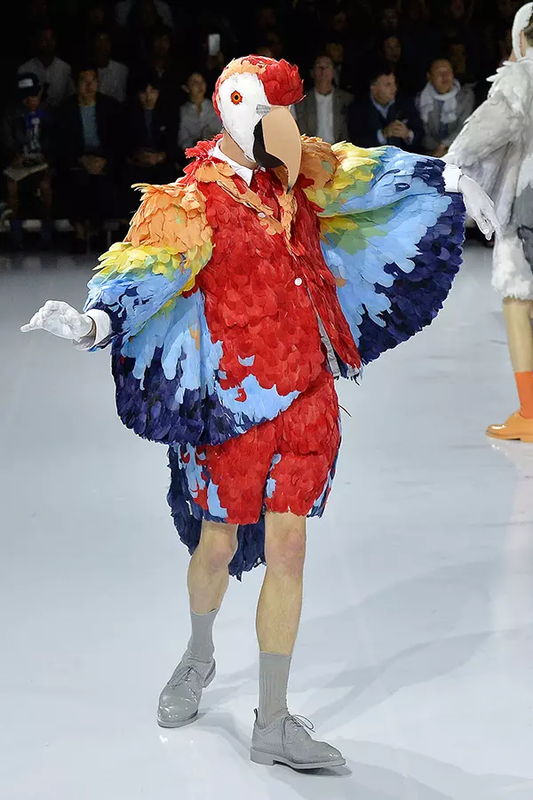 His high-concept shows have variously featured models dressed as tailored parrots, or attached to poles as kimono-wearing scarecrows. 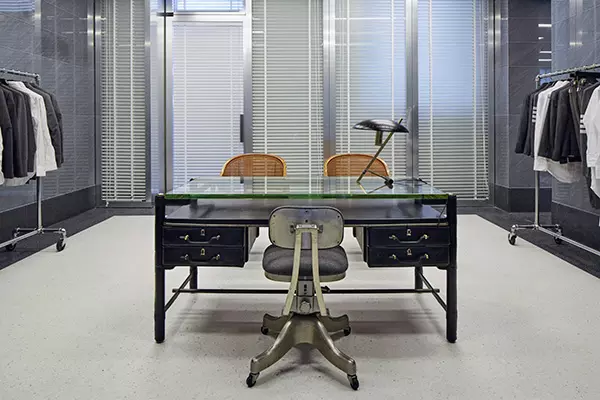 His offices appear like a Busby Berkeley musical set in a frantic design studio: floor-to-ceiling glass windows for interior walls, metallic-slat blinds set half-shut, the entire staff in variations of the Thom Browne look. I am greeted by an assistant in shorts that are even tighter and shorter than Browne’s. Hector, Browne’s two-year-old wire-haired dachshund, pads between desks, his nails clicking on the floor as he walks. Fancy a silver leather bag in the shape of Hector? He can be yours for £1,960. “Everybody thinks it was such an overnight thing,” says Browne of his career. He started making his suits in 2001, selling them from his apartment, and then opening a small store in the Meatpacking district, which was then still a place where meat was packed. “People always wondered why my shop was never open,” he says. “It’s because I was going to the factory, all by myself, carting the stuff back from Long Island City.” Browne used to hand-write the labels sewn on to every single garment. It was only in 2011 that the size of the business prevented him from doing so any more and he had to buy a printer. 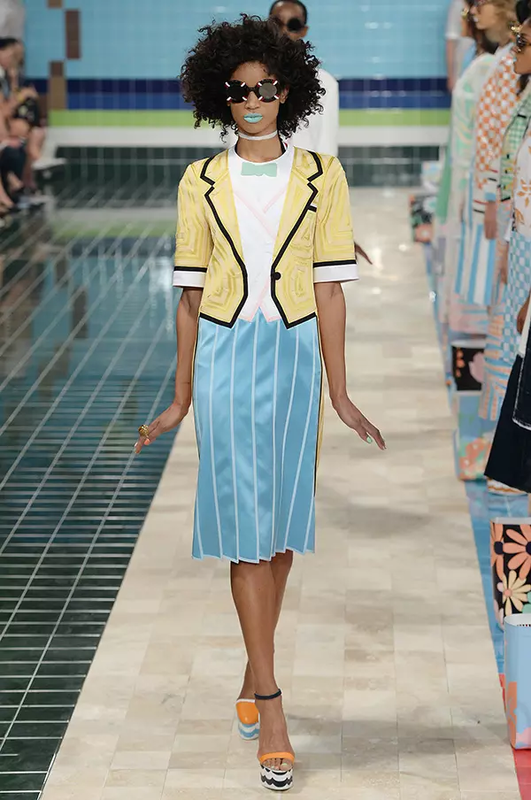 The Thom Browne aesthetic may be strict in its essence, but like Comme des Garçons, Browne has created a successful brand through the clever commercialisation of his most outlandish looks. The “pure version” he describes is only worn by a dedicated few: Browne, his staff, Browne’s partner Andrew Bolton, who is curator-in-charge of the Costume Institute, and ardent fans. But he also offers far less dramatic versions of his catwalk designs in the commercial collections. Wearing Browne doesn’t require you to wear your pants hoiked up in the crotch. “It’s not always like this,” he says, of his own short suit. “It’s important for people to see us so they have that really strong image in their minds. But we do made-to-measure that’s just a beautifully made suit.” A perfectly cut grey flannel suit costs £2,050; a white Oxford shirt is £320. In order to keep the brand going, Browne sold a majority stake in his company to Japanese apparel group Cross Company, later Stripe, that same year. At the time his annual revenues were said to be about $6.5m. Browne showed in Paris for the first time in 2010, and debuted womenswear. The pair are also overseeing the opening of a number of standalone stores that stock both men’s and women’s. One such store has already opened in Milan on Via Gesù. The first London store will open at the end of the month. Each store is furnished with the same, strict decor of Browne’s office and his home — clean, minimal and specific. “Someone said that you could hose down my apartment,” says Browne. The designer lives near Columbus Circle with Bolton, his partner since 2012.